I must say its nice to be back, been away due to poor health and the rigors of rehab. October 2012 Bokeh Set contains twelve softly blurred bokeh textures. Hope they can be of use ~ have fun! Thank you very much I love both sets! More thanks to you, Jerry!!! Works fine for me, try downloading again. Thanks, Jerry! Hope you will be 100% soon! Thank you Jerry. I hope your health improves and that you are feeling much better very soon. Thank you Jerry! I hope your health continues to improve and that you are feeling much, much better very soon. Take care. Welcome back - and hope you continue to improve! Thanks for the great textures! Thank you, Jerry. You always happen to offer just what I'm looking for. These are incredibly beautiful. Thank you so much for this post. I want to let you know that I posted a link to your blog in CBB Digital Scrapbooking Freebies, under the Page 4 post on Oct. 13, 2012. Thanks again. Thanks Jerry. The textures are beautiful! Praying you feel better soon. Thank you, and I hope yuo get better very soon. Thank you very much for all the wonderful tips and goodies. Welcome back you were missed. Lovely new set. Thanks Jerry, I downloaded both new sets! Thank you for making this set available, it's absolutely beautiful! I hope you feel better soon. Not long found your site - it's brilliant, you have taught me loads. thanks for these. take good care of your health. All your textures are amazing. Thank you so much. I hope your health improves soon! So sorry to hear you haven't been well. 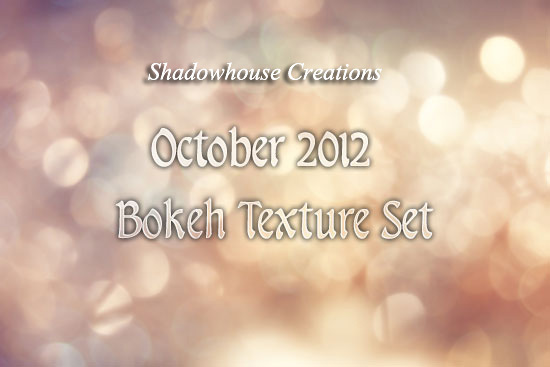 Love the October Bokehs...simply beautiful and I can't wait to start using them. Hope you feel all better soon! Thank you for the lovely bokeh.